Ski for free 2020 all season. I'd have really liked to have taken you up on your kind offer @nixmap, but you posted it 2 days too soon for me. So seriously ... any volunteers ? What is expected from you for 2019/20? And an SR from your previous 'season hosts' would be extremely helpful / illuminating. Same as before although child minding is relegated in favour of party planning and occasional guest ferrying. Privacy is a good thing but its not enforced by me. I think you will find that respect for our privacy comes from a mutual understanding of those involved and a sense of a win win outcome. Being subject to a 'snowhead inquisition' is also something best avoided. No doubt it’s fine for a weekend but surely pretty dull for a season no? Where else can you ski round there? @BobinCH, there's nowt wrong with getting to know a small area intimately. . . .
and . . . 5.4.3.2.1 . . . my mind is not always in the gutter you horrid people It actually looks quite a pleasant challenge for an intermediate skier/boarder to hammer down their techniques and I suspect a fair amount of off piste fun too. Since we've not heard directly from them maybe it took 3 years to escape from the cellar? In the meantime well done for putting up with us and giving as good as you get. In the meantime we’ll done for putting up with us and giving as good as you get. Sure any time if you make it public you when apply, you will be subject to the snowheads grand inquisitor. Intimacy is exactly the word that summarizes the overall ethos of the whole idea. Masque, you are quite the poet. But its the wrong place. Where is it then? The fact that you are so coy about the location suggests it’s not very good. Which is a problem if you’re advertising it as an attractive season long skiing option. A few years ago it was Klosters and Gstaad. @rambotion, well he says it’s not Meiringen so who knows but if it was half decent surely he’d say where it was. 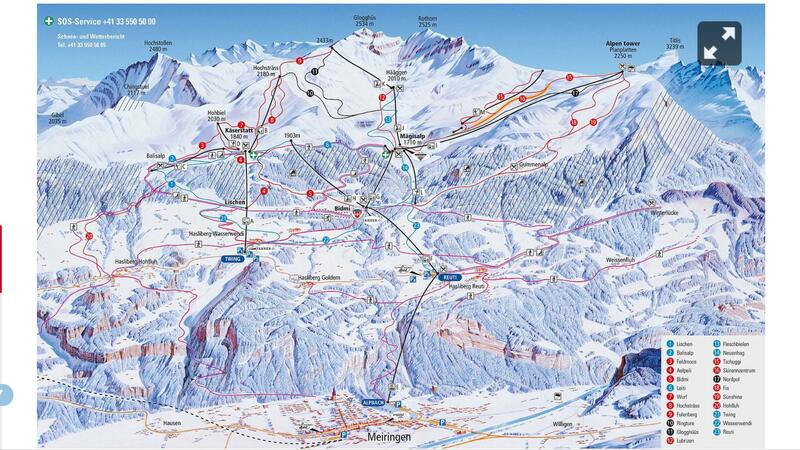 And going to nearby resorts, notwithstanding the need for a car / fuel / time to get to, are going to be very expensive for day passes if they are any good eg Engelberg (I see Titlis in the background on that piste map if it is in fact Meiringen). So given he’s not paying you’re essentially getting an apartment in a not very sought after area in return for whatever work is required. Might suit a hermit, beginner, who can generate some income working from home, but doubt the appeal would be very broad. And the fact that he’s so coy with any further details suggests he doesn’t want them available for others to comment on (eg compare a comparative rental cost for a season rental) which is hardly encouraging. So come on Nix, tell us why you are hiding all the important details? @BobinCH, don't indulge him. He's just a form of troll who gets off on the secrecy and has no desire to be part of the community once he gets his free workers. As above, in 2015 it was Gstaad and Klosters. It may still be. Hardly poor resorts or for beginners only. From that post, use of a 4x4 was also included. All the poor folk getting upset cos some dood with cash wants a cheap servant for a few weeks. I prefer the description "happy volunteers"
So come on Nix, tell us why you are hiding all the important details? I figured I posted it so many times before the details are getting repetitive. Depends what lens you look through, I am always optimistic that for the right couple, its win win. WOW , we have had so many good times with our volunteers, I dont even know where to start to reply to this negativity. @nixmap, that doesn't answer DotM point that apart from coming on here once a year in search of volunteers/unpaid workers, you contribute nothing else to the site. Did we ever establish what resort it's in? @adithorp, But is that true? or is it hyperbole? or hyperbollocks? a search reveals a handful of posts on other matters. Portrait mode in 2019, I mean, really? @Riccardo, fair enough, a quick search does show @nixmap, has made about a dozen posts in the last 2 years unrelated to their "volunteers". @adithorp, My hyperbollocks comment was (in my head) a criticism of the seemingly arbitrary judgement of whether someone is/isn't making a 'contribution to the community'. But you've now defined quite explicitly what making a contribution is and I must admit wasn't aware of it and possibly @nixmap wasn't either. Maybe make it a sticky so others are not caught out in the future? I have a question, it's not a criticism; why do skiers feel the need to "twerk" their way down every nice powder field? Hmmm. I don't always ski powder in short swings but I admit I love the sensation of turning in untracked powder so the more turns the better to some extent. Big surfy turns are almost as much fun once the snow is heavier and tracked so I may well have the first couple of runs in short turns and migrate to big surfy turns once its been skied a bit. What I like best are slopes spotted with trees and bushes, little mounds and roll overs where you have to adjust to the terrain - swoop across an open stretch, wiggle through some obstacles then open it up again. Well he's never posted a trip report, some stoke of the skiing of which he obviously takes copious videos other than in his ad thread to troll a bite, much advice on CH skiing more generally and none of his "slaves/mates" never sem to have posted even a guide to the resorts they must be intimately familiar with. Doesn't sound like sHs is much more than a handy noticeboard for him. He might be a lovely charming funny bloke who is great fun to hang out with but manages to hide that all under a bushel in his online persona. A yes as far as I'm concerned.